On October 14, 2012, Austrian jumper Felix Baumgartner broke three World Records: the first human to break the sound barrier without the assistance of a vehicle, the highest manned balloon flight, and the highest skydive. He was awarded the coveted 2013 Laureus World Action Sportsman of the Year. Standing on the step of the capsule, Baumgartner made a short address, saying, "I know the whole world is watching now. I wish you could see what I can see. Sometimes you have to be up really high to understand how small you are... I'm coming home now." Baumgartner saluted and dove forward off the ledge at 12:08 MDT. Mission Control acknowledged this by saying, "jumper away." After 50 seconds of descent, Baumgartner reached his maximum velocity -- 1,357.6 kmh (843.6 mph; Mach 1.25). An uncontrolled spin started within the first minute of the jump which could have been fatal, but ended at 01:23 when Baumgartner regained stability; he likened the fall to "swimming without feeling the water" as he could not feel the air to give him a sense of direction. After 03:40 of free fall Baumgartner radioed to Mission Control that his visor was fogging up, echoing his earlier concerns about its heating. After 04:16 minutes of freefall he deployed his parachute, which opened and arrested free-fall at 04:20 minutes. 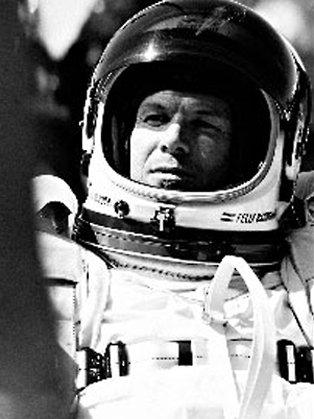 Approximately 9 minutes after jumping from the capsule, Baumgartner landed on his feet in eastern New Mexico. Baumgartner dropped to his knees and punched the air in victory. Baumgartner's jump was 65 years to the day after October 14, 1947, when US Air Force Major General pilot Chuck Yeager broke the sound barrier for the first time in a piloted aircraft. 8 million people watched the live streaming event; the jump was the most-watched live event on the Google-owned website YouTube. Born on April 20, 1969, Felix was raised in Salzburg, where he dreamed of skydiving and flying helicopters and was inspired by astronauts on TV. He made his first skydive at age 16. After sharpening his parachute skills as a member of a Special Forces demonstration team for the Austrian military, he supported himself by repairing motorcycles before becoming a skydiving professional. In the 1990s, Felix extended the range of his canopy skills with BASE jumping. In 1997, he won the overall BASE jumping championship at West Virginia's Bridge Day, which draws competitors from around the world. His 1999 jump from the Petronas Towers in Kuala Lumpur established a new world record for highest BASE jump from a building; and that same year he completed the lowest BASE jump in history from the Christ the Redeemer statue in Rio de Janeiro. A sampling of Felix's additional records includes jumping from the Millau Bridge in France (record for highest span) and Taiwan's Taipei 101 tower (new highest jump from building). He even BASE-jumped into a Croation cave equivalent to a 60-story building in depth. Outside of his penchant for daredevil acts, Felix was named to Vienna's Street of Champions and nominated for a World Sports Award and two categories in the NEA Extreme Sports Awards, Felix is also an advocate for the nonprofit Wings for Life Spinal Cord Research Foundation. Felix divides his time between the United States and Switzerland; but, he acknowledges, "The air is where I am at home."